Take advantage of these 2018 SF Bay Area Water District Rebates while they last. Water conservation rebates for 8 SF Bay Area districts. Everything you need to know including how much you will save, prerequisites and other details. Plus links to each district. 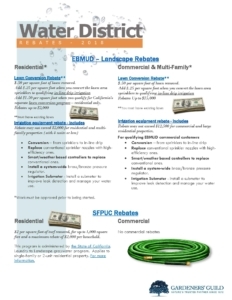 Commercial and residential water district rebates. Most popular are the “cash for grass” programs. Also rebates for efficient irrigation equipment. Want a printable report? See link below. $.50 per square foot of lawn removed. Add $1.50 per square foot when you qualify for California’s separate lawn conversion program – residential only. Replace conventional sprinkler nozzles with high-efficiency ones. Smart/weather-based controllers to replace conventional ones. Install a system-wide brass/bronze pressure regulator. Irrigation submeter – install a submeter to improve leak detection and manage water use. Rebate may not exceed $12,500 for commercial and large residential properties. Irrigation Submeter – Install a submeter to improve leak detection and manage your water use. $2 per square foot of turf removed, for up to 1,000 square feet and a maximum rebate of $2,000 per household. This program is administered by the State of California. Laundry to Landscape Graywater program. Applies to single-family or 2-unit residential property. For more information. Applies to single-family and duplex residential customers only. Replace with District approved, low-water use planted landscapes. Up to $50 per 100 square feet of lawn area. The incentive is limited to $400 for single family dwellings, $100 for townhouses or condominiums, and $50 for apartments. Uses weather data and site information to automatically adjust watering schedules. Increases water use efficiency. Reduces run-off and improves the health of your landscape. It can save 30% or more on your landscape water use. It is less expensive than you might think. The incentive is limited to $400 for single-family dwellings, $100 for townhouses or condominiums, and $50 for apartments. Options – See link for details. $.50/sq ft up to max of 500 sq ft or $250. $.50/sq ft up to max of 5,000 sq ft or $2,500. Converting high water use turfgrass with district approved, low-water use, drip-irrigated plants or permeable hardscape materials. Receive up to $1 per square foot – up to a maximum of 5,000 square feet for customers who replace turf with water-wise landscaping. Provides rebates (amount not shown) for water efficiency improvements to irrigation systems as well as indoor water using appliances. Customer must meet certain criteria to be approved. Program ends June 2018, or when funds are depleted. Get up to $1,000 by replacing your water-thirsty front lawn with a water-wise landscape. $12 per active (used) irrigation station (zone) up to 50% of the list cost of the controller(s). Limit one rebate per customer per address. Get up to $50 for equipment and installation on a qualifying system. Get up to $50 back on a qualifying pool cover.